SpaceX’s first national security space mission for US, launched on Sunday night (IST) had an Indian link. A young Indian-American engineer, Siva Bharadvaj, who works for SpaceX as an integration and test engineer for the company’s Falcon-9 rocket, co-hosted the nearly two-hour international webcast. The mission carried the GPS 111 satellite for the US Air Force. During the webcast, Bharadvaj explained the details of the mission, which kept viewers engaged. 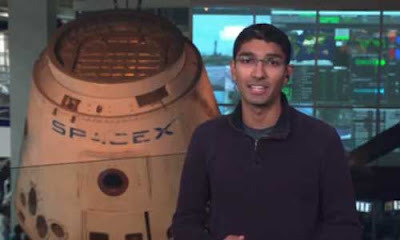 He was selected in early 2018 to be a part of the SpaceX webcast team. It was his second live webcast of a SpaceX mission. On November 15, 2018, he co-hosted the launch of the Es’ Hail-2 communication satellite by SpaceX for Qatar. On December 5, 2018, SpaceX launched a satellite ExceedSat-1, designed in Mumbai and integrated in Hyderabad, which is mainly for the benefit of ham radio operators. SpaceX’s ties with India is not restricted to rockets and satellites alone. Bollywood actress Deepika Padukone had, a few days ago, reacted to SpaceX chief Elon Musk’s tweet about ‘Bajirao Mastani’. Elon shared the song ‘Deewani Mastani’ and a GIF featuring Ranveer Singh.